The crisp fall wind on the evening of didn’t discourage anyone waiting in line outside Rackham Auditorium at 6:30 p.m. on Thursday, Oct. 11. Their arms were crossed to keep warm but their spirits couldn’t have been higher: they were just half an hour away from seeing Benj Pasek and Justin Paul — the writers of Tony award-winning Broadway Musical “Dear Evan Hansen” — speak live. The line, which stretched down the steps of the auditorium and down Washington street, began to move, and people pulled their tickets out of their pockets excitedly. Once inside, every ticket-holding guest was given a copy of Pasek and Paul’s novel, “Dear Evan Hansen,” which contained a signed bookplate and a raffle ticket, which would be drawn at the end of the night to give five audience members a chance to meet Pasek and Paul. In honor of the “Dear Evan Hansen” book tour, Literati Bookstore hosted the special event at University of Michigan, where Pasek and Paul both attended college. They graduated in December of 2006, both holding BFA degrees in musical theatre. “Dear Evan Hansen,” which quickly became a smash-hit Broadway musical after its debut in December 2016, details the story of Evan Hansen, a teenager with extreme social anxiety. His therapist suggests he write letters to himself as an exercise. While printing one out at school, Evan encounters Connor — a loner and bully — who reads the letter and is livid at the mention of his sister, Zoe. Connor is found a few days later after his suicide. When he is discovered with Evan’s letter in his pocket, authorities believe it is his suicide note, addressed to Evan. Evan can’t help but lie, creating a fictional story in which he and Connor were friends. The lie carries throughout the show, shaping Evan’s life. After the musical launched Pasek and Paul to fame, fans were very excited to welcome them back to their alma mater. The program began soon after 7:00 p.m., when the Emeritus Chair of University of Michigan’s Department of Musical Theatre, Professor Brent Wagner, gave a speech to introduce Pasek and Paul. Wagner spoke about his relationship with Pasek and Paul when the two were in college, speaking to their strengths as actors in the program. “I actually think their writing is especially good because they started off as actors,” Wagner said. He then continued to praise them for their success: According to Wagner, one-fourth of Broadway productions are successful, and three-fourths are based on already existing material. “Evan Hansen is completely original,” Wagner said. During the final moments of his introductory speech, as the audience members itched with anticipation, Wagner gave one final introduction: Darren Criss, UMich Acting alumni, film star and Broadway actor, would be the host of the event. As Wagner finished his speech, Pasek, Paul and Criss walked onstage and the crowd screamed with joy. The three sat down, joking and interacting with the audience. Pasek complimented Criss for being charming, warranting cheers from excited fans. Once they were settled, Criss began asking questions. He started off by asking them about the beginnings of their relationship. They joked about how they became friends during their dance classes at UMich, talking about the ways they would try to get out of having to dance. “We bonded over being the two worst dancers in our ballet class,” Paul said. 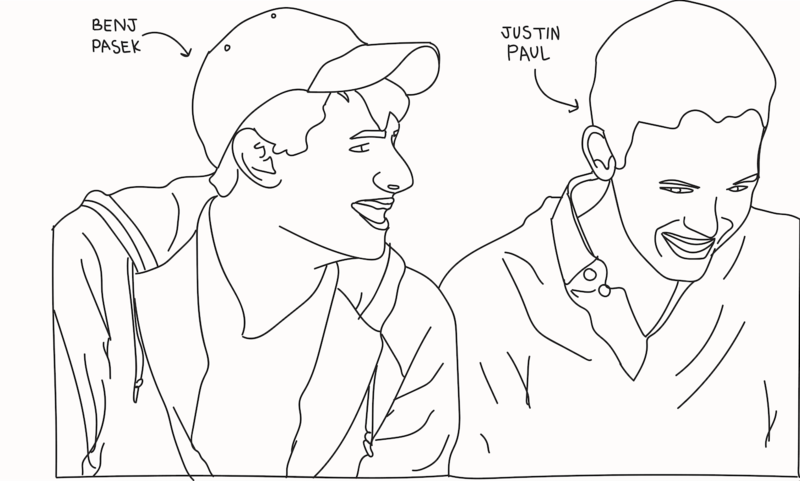 Pasek continued to talk about how their songwriting relationship began: He wanted Paul to help him embellish some songs during their freshman year, and they ended up writing four songs together. During their sophomore year, when the two were cast as nonessential ensemble roles in Michigan’s production of “City of Angels,” they decided to write their own show, which they later performed at the Kerrytown Concert House. “The first song we wrote was a super weird pop song that didn’t make any sense,” Pasek said. Pasek answered the question, talking about how he had first noticed a phenomenon while he was in high school: When someone at his high school passed away over the summer, the students came back to school with stories of the person, acting like they had a special relationship with the deceased student. Pasek said he too was guilty of embellishing his stories. “I wanted to be a part of a tragedy that I had no right to be a part of,” Pasek continued. And they noticed similar events on a much larger scale: they knew people embellishing and/or making up stories of people who passed away in 9/11, as well as posting online about deaths of celebrities. They couldn’t help but wonder what made humans so lonely that they felt the need to lie about things like that, and how that lie could make them feel so much better. Of this question came the central idea of “Dear Evan Hansen,” a story of a boy who does just that: lie about his relationship with a dead person to feel less lonely. The musical took years to finalize, but once it debuted, Pasek and Paul were overwhelmed with stories: people shared personal memories of experiencing the same phenomenon, of losing someone to suicide, of experiencing suicidal thoughts themselves. The flood of stories showed the two young writers how powerful their story was, and how they had such a large opportunity to make an important impact. They decided that they didn’t want “Dear Evan Hansen” to only be accessible in New York for the price of a Broadway ticket: they wanted it to reach people all across the nation. They discovered that by writing a novel version of “Dear Evan Hansen,” they could provide an opportunity for more depth than the musical provided: more points of view and development of different relationships. With the novel, they had the chance to learn more about Connor — the boy who passed away at the beginning of the story. The audience got an example of Connor’s thoughts when Criss stood up and performed a dramatic reading of a passage from Connor’s point of view. The auditorium fell silent, holding onto Criss’s every word as he portrayed how Connor felt directly after dying by suicide. After Criss’s tear-jerking performance, Pasek and Paul continued to discuss development of previously unseen relationships in the novel, ultimately inviting Chelsea Packard — UMich musical theatre alumni and Broadway star — and her husband onstage to sing “Only Us,” a romantic duet between Zoe and Evan: another relationship that the novel embellishes upon. As it became apparent that the discussion would have to end soon to leave room for a Q and A section at the end, Pasek and Paul began to discuss the outcomes of the show. Though Evan lost many relationships once his lie was revealed, one person he never lost, the writers reminded the audience, was his mother. “[His mom] represents the people that are always going to accept you and love you exactly the way you are,” Paul said. When asked about their goals for the book, Pasek and Paul responded with positivity and hope. With a quote from the show, Criss ended the discussion portion of the evening, opening the floor to questions from five lucky audience members. One audience member asked a question that warranted responses from all three men: What advice did they wish they had been given earlier in the process? “When you think that your work is terrible, that is the best time in the world,” Pasek said, quoting Ira Glass. He continued to discuss the process of revision, and how it is okay to have bad work: you can only revise it and make it better. “At least you know that you’re bad,” Paul chimed in. After the Q & A portion of the evening was over, Criss chose five raffle winners, all of whom stayed after the main event for a meet and greet. They welcomed Packard back to the stage to sing “So Big/So Small,” a heartbreaking solo from Evan’s mom’s perspective. Applause rang through the auditorium after the song, and Criss began to end the night. “Thank you all for being here, go blue and all that stuff,” Criss said, warranting laughter from the crowd. And finally, Paul moved to the piano one final time and Pasek, Paul and Packard performed “You Will Be Found,” the Act One finale and iconic song of hope from the show. Immediately after the final note, the audience sprung to their feet, cheering and clapping, and finally exited Rackham Auditorium, hearts full.